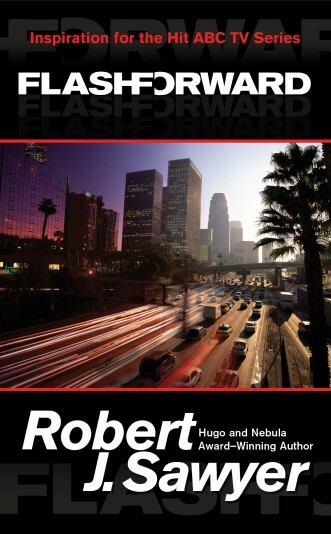 Robert J. Sawyer » Blog Archive » How do you spell “FlashForward”? by Rob - May 10th, 2016. There’s seem to be some dissent on the topic of how to capitalize/space FlashForward. Is it FlashForward or Flashforward? Or Flash Forward? It’s an interesting question. The official TV series spelling was FlashForward, but since the wordmark was always rendered in all-caps on screen, that wasn’t obvious to most people (although that’s what you saw in the press coverage). My novel’s title was Flashforward, per the manuscript and title page; also, it was one word with a capital initial F per the usage of the term to describe the phenomenon in question in the text of the novel. But someone in the art department at Tor blithely put it BOTH as two words (front cover and spine of dustjacket) and one word (title page, page headers, and back cover of dustjacket) on the first edition, without ever once checking with me. Not only did that screw up turn-of-the-century search engines and Amazon (searches for one did not turn up the other; Amazon had “Flashforward” linked to the hardcover but “Flash Forward” linked to the paperback, and reviews of the former weren’t carried over to the latter), but it also caused the book to be left off the preliminary Nebula Award ballot (you needed a minimum of ten recommendations from SFWA members, which I had, but they were split between the two spellings and the person in charge couldn’t see that they were obviously for the same book until it was too late). The copyright page of the first edition says FLASHFORWARD, all capitals. Since the advent of the TV series in 2009 seven years ago, I’ve used unified branding, and consistently referred to the book in camel case: FlashForward. Call that the author’s preferred spelling. The latest paperback edition from Tor uses the TV series wordmark: FLASHFORWARD. Flashforword is an acceptable alternate. The two-word version, “Flash Forward,” is wrong (despite its use, along with the one-word version, on the Tor dustjacket), and that mistake should not be perpetuated.